How does one listen to a music in 2010 GLK350 in 2015? In my previous car I would insert a 64GB USB drive, select the source and the music would flow. Here I'm greeted with a rather cumbersome choice. - inside the compartment there's a rectangular connector that looks like a Media Interface that has a 3.5mm adapter for AUX. Can that thing be transformed into a USB connector instead? I'd just use my 64GB USB drive. Can it read the folders? - Memory Card, what PCMCIA adapter do I have to get on Amazon and what's the highest capacity for SDHC card, 32GB? No 64GB? - is Music Register useless? - I understand the Bluetooth is for voice only and not streaming music so it all goes back to buying some Bluetooth device and connecting to Media Interface. Last edited by MysticMan; 09-02-2015 at 10:54 AM. 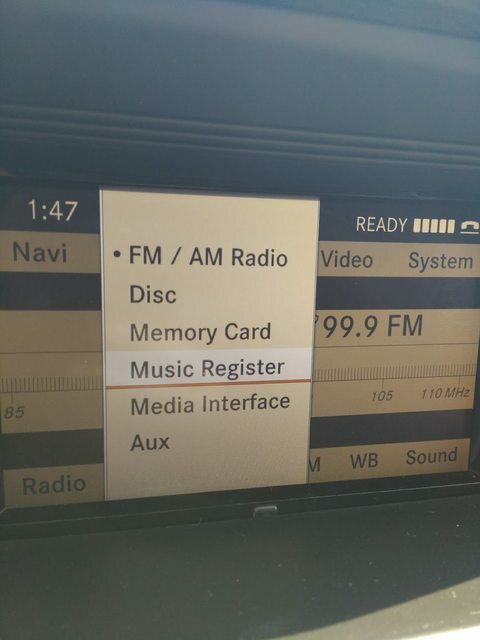 Thanks, I looked up Mercedes Benz Media Interface Plus. It seems to give Blutooth streaming and USB. Is this gonna compete or replace the original Bluetooth phone connection? Apparently the Music Register lets you store some media on the HDD used by the GPS system. I saw the instructions in the manual but don't remember the steps and haven't tried. It wasn't obvious. The SD card option seems to balk at the bigger and faster (like Class 10) cards and the larger 64GB. I am using a Class 4 32GB in a PCMCIA adapter I bought online that was made in China. It balks at times even with that. Not sure if it's the Comand, the PCMCIA or the Micro SD but the interface will freeze at random times. It will keep playing if something is happening but won't display or change anything. It comes back to proper operation when I eject the PCMCIA adapter. I seem to have a Lightning Connector for an iPhone or iPod as well as a 3.5mm jack in the glove box but haven't used them. When I plugged in an Android phone into the 3.5mm jack I wasn't getting any tunes. It could have been settings in the Comand interface. Headphones worked on the phone so I presume it wasn't the phone. To add Bluetooth streaming to your 30pin media interface cable - Tune2Air - do a web search. Can I stream Tune2Air music and answer the phone through Command at the same time? Can Android phone connect to both Bluetooth devices simultaneously? Thanks for a detailed answer, I have an ancient slow 32GB card, will try that with adapter. Small stuff wears me out - and all I am trying to do is be helpful. If you have cable interface AND add Tune2Air - yes, you can BlueTooth music AND Bluetooth phone.... WMA1000 if you have iPod 30-pin cable... WMA3000A plugs the Tune2Air directly to media interface port.. The rectangular adapter can accept a cable with a mini headphone female jack at the other end, or a cable that splits into two, and adds a 30 pin iPod female to the headphone jack. The easiest BT audio solution as mentioned previously is the Tune2Air, and the 3000 model if you don't already have a cable with a 30 pin iPod female. You'll have song info appear on COMAND and be able to use steering wheel controls as well, and it will mute when the phone is in use. To transfer tracks to Register from your SD card it must be in FAT format and partitioned in 32Gb chunks. Files must be MP3 or WMA. Music Register is GREAT. Have dozens of CD's recorded on it. I just recently bought my girlfriend a 2010 GLK, the car is so spotless I absolutely love it, but we've only had it 3 days and she already wants to sell it because we can't figure out a bluetooth option. It doesn't have the iPod or USB jack in it, and apparently the only system I can find is the Android based units from China, but they're so much conflicting information on whether or not they work I don't feel comfortable pulling the trigger on one yet. Is that really the only option I have? I really love this car but we won't keep it if I can't get some kind of Bluetooth connectivity. Am I understanding correct that you can have either one of these or the other, the iPod intergration cable being the older available option? I have a base GLK with no Nav/Command. If the media interface option would work I could install the plug in BT transmitter to it and bam! Streaming audio! Ive never owned a vehicle that had so many interface problems / options so I have been feeling mixed up. 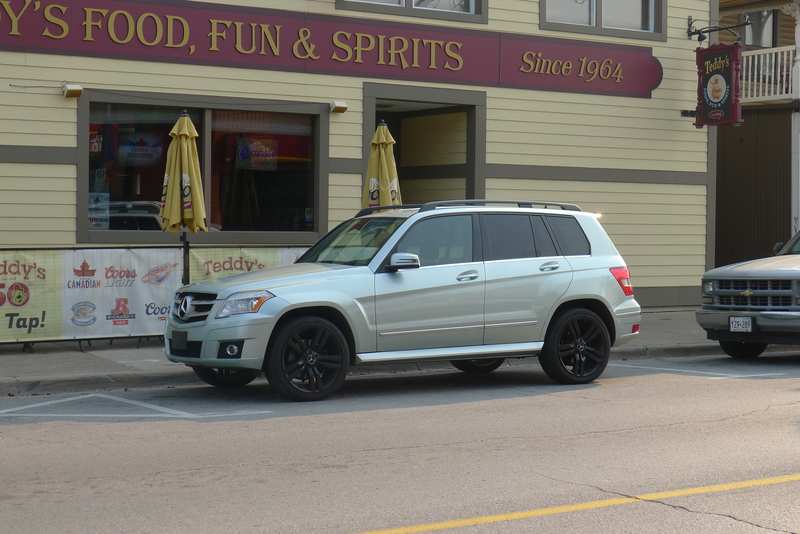 Quick Reply: How does one listen to a music in 2010 GLK350 in 2015?